Live By The Axe Warrior Hoodie - Mad Viking Beard Co. Available in sizes Small – 5XL. Also offering talls in select sizes! 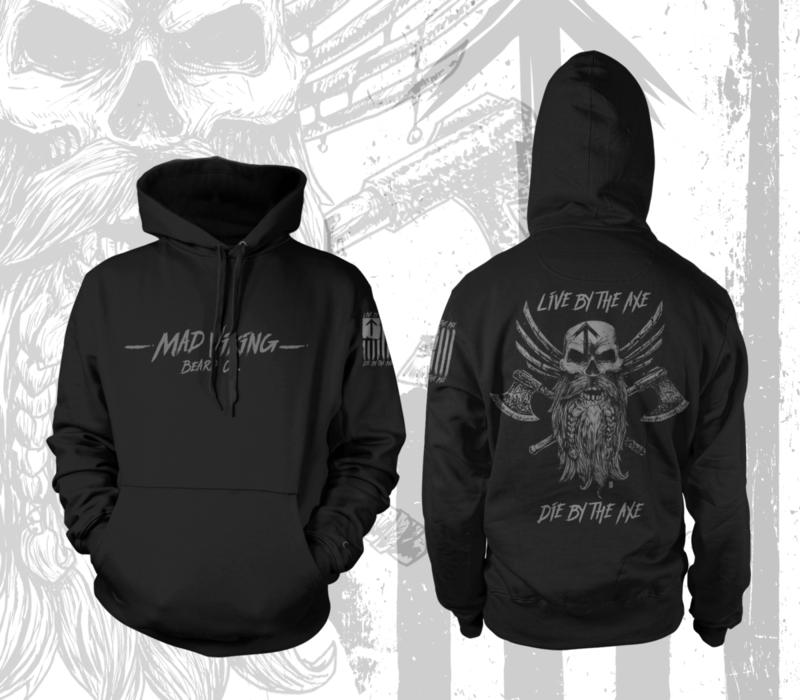 Mad Viking proudly offers the “Live By The Axe” Warrior Hoodie. The material is a 50/50 poly cotton blend in 8oz weight. This hoodie has a super soft feel, holds its colors and graphics without fading, and provides the perfect amount of protection from the elements. “Live By the Axe, Die By the Axe” has been our credo since our inception, and this logo pays homage to all the warriors in our lives. Consequently the Blodorn (blood eagle) logo paired with a set of battle axes in the background are the perfect imagery to match our views. Also you will find the rune of Tyr. In Norse mythology Tyr was the god of war and justice. We live our lives without apology. We let the world know who we are, and with the the Live by the Axe hoodie, you will too! Get yours now and show the world that you are willing to go the extra mile to live life to the fullest! Don’t forget to grab the “Live By the Axe Warrior” tshirt while you’re here!